The Theatre and Café on the Palace Pier, photographed in 1958. Originally this was a Pavilion and Concert hall but was remodelled as a theatre and café about 1910. In this form it was very popular and well supported until in 1973, it was very seriously damaged in a gale and never reopened. Most of you will already know that the Noble Organisation, who took over the Palace Pier, in 1984, have put this iconic Victorian Grade II* listed structure up for sale. The pier is phenomenally successful in that it is visited by over four million people from all over the world every year and is loved by visitors and locals alike. Now that it is up for grabs, international bidders will tough it out with domestic prospective buyers to own this well loved city landmark. In 2000 the Noble Organisation caused enormous local controversy by taking down the original ‘Palace Pier’ sign and replacing it with one saying ‘Brighton Pier’. Unsurprisingly, there has been a swell of local feeling towards putting pressure on the successful new owner to reinstate the ‘Palace Pier’ name. In fact for most locals the structure, originally titled the Brighton Marine Palace and Pier, has never been anything else, but the general consensus is that it should be made ‘official’. We the undersigned petition the council to recognise that the sale of this city’s 112 year old pier provides the perfect opportunity to actively work with any potential owner to ensure that the currently named ‘Brighton Pier’ is officially restored to its original name by which it is still affectionately known by local people today – ‘the Palace Pier’. Unfortunately the e-petition has now closed. I was born and bred in Brighton and I have very fond memories of the Palace Pier and have never thought of it as anything other than the Palace Pier. In the mid fifties my mum and I would go to the theatre on the pier every week because a very dear friend, Gerry Jones, belonged to the repertory company who performed there. Other actors who were around at that time were Barbara Whatley, Julia Foster and Judy Cornwall. Gerry went on to appear in some children’s television plays and ended up as a BBC Radio drama producer. I wonder if anyone remembers him? I was born in Brighton and grew up there until I was nearly sixteen. I loved the Palace Pier and still call it that now. We used spend hours on there and watch the people fishing, go on the penny slot machines, used to love the ones in the glass machines where you put a penny in and it would tell your fortune. There was one that would laugh at you; then we would have an ice cream or a candy floss. I can remember when I was little I used to hate the gaps between the boards because I thought you could fall through into the sea. Every time I have been back to Brighton I always go on the Palace Pier. My first memory of the Palace Pier was Easter 1939, yes 1939, when my father took me to an entertainment in the theatre at the end of the pier. All I can recall of the show is that on returning home my father said the comic was disgusting; I do not know how he would react to the modern so called comics. I have so many memories of the pier, even picking up holiday makers and then my baby niece kicking her shoes through the railings into the sea, much to my mother’s surprise etc. I used to go to see shows in the theatre well into the early ’60s with the current girlfriends. It should never have had a name change. As far as I am concerned, there IS no Brighton Pier. It is Palace Pier, always was, always will be to those of us born and raised in Brighton. The question arises as to why the new owner was allowed to change the name of such an icon in the first place, perhaps it should have been made a condition of sale that it remained Palace Pier (note for any future sales of Brighton historical monuments!). My fond memories will always stay with me. On a recent trip back I took several walks to the end and back, remembering great times and ice creams shared with people long gone. Yes, Palace Pier is Palace Pier and shall always remain so to many many people. Absolutely right Patricia. Anyone remember those little caps for our high heels? These were used to protect our heels from scuffing as we “toddled” along trying to avoid the gaps! Oh, the memories of great times with our friends eyeing up the lads on the PALACE PIER! Hopefully sense will prevail one day and it will return to its correct name! 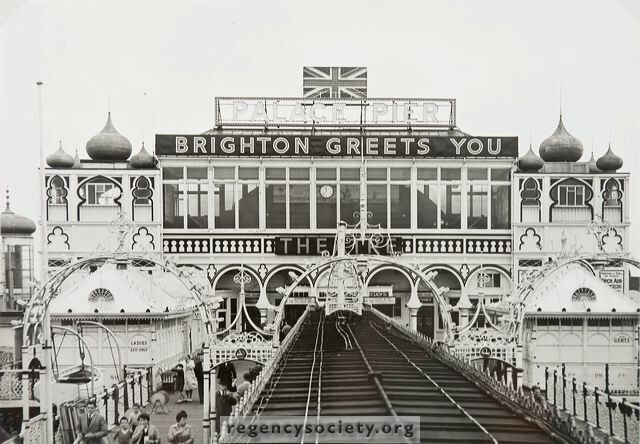 During my years in Brighton the town had its Pavilion, the seafront had its Palace Pier. Why on earth would anyone wish to change a seemingly local institution? There’s only ever been one name the pier has been known by, and ever more shall be so. I have always believed that the change of name displayed so prominently should have been subject to planning permission. The sale of the pier might provide an opportunity to put it right. Yes of course I have signed the petition, let’s hope the powers that be take note.It’s always been the Palace Pier to me and many others that were born and bred in Brighton. I know we only have a bit of what’s left of The West Pier but, it’s still there & you have to distinguish it. Calling it The Brighton Pier leads you to believe there has only ever been one! Who gave permission for the Noble company to change the name of the pier, because I think it should have been put to vote to the people who live in Sussex. It will still always be called the Palace Pier. My father and myself worked on there about 50 years ago; I have seen lots of changes but never expected to see the name changed!